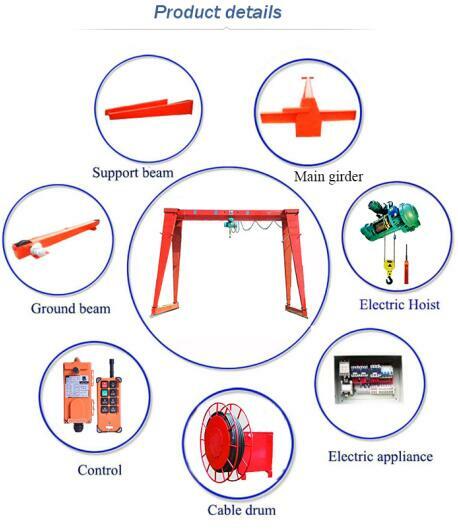 MH type single girder gantry crane is used together with CD1/MD1 Model Electric hoists .It is a track travelling small and medium-sized crane. Its proper lifting weight is 3.2 to 32 tons, proper span is 12 to 30 meters. Its proper working temperature is -20°c to 40°c. This product is a regular crane widely used at open ground and warehouses to load and unload or grab materials. It has 2 controlling methods, namely ground , controlling and room controlling. We have components supplier from all over the world. Such as ABB, SEW-EURODRIVE, SIEMENS, SCHNEIDER and so on. You can choose any brand to equipment your cranes. Also, we have many kinds of crane spreader for your choice.